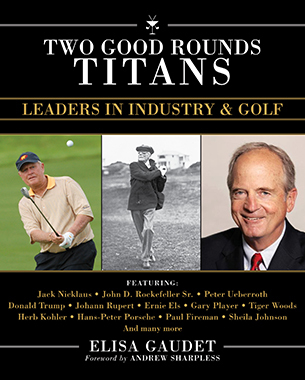 Two Good Rounds: TITANS—Leaders in Industry & Golf explores the connection between golf and business, highlighting Jack Nicklaus among PGA and LPGA Tour professional golfers who have leveraged their careers and created brands with businesses expanding beyond their competitive purse winnings. Further, 33 of the top CEOs in the world share how they got started in their career, greatest achievements, advice, how golf and business are related, and golf and life tips they have learned. The interviews provide great inspiring stories from well-known leaders from various industries. In addition to Jack Nicklaus, golf greats Arnold Palmer, Ernie Els, Tiger Woods, Annika Sorenstam, Gary Player, Greg Norman, and Ben Crenshaw are also featured. Business leaders profiled in the book include John D. Rockefeller Sr., Herb Kohler, Hans Peter Porsche, Michael Smurfit, Peter Ueberroth, Donald Trump, Gilberto Benetton, Andrea Agnelli, and Catherine and Rene Lacoste, among others. The book, like a great “19th hole,” is a way to share golf memories with family and friends. Written by Elisa Gaudet, Two Good Rounds: TITANS—Leaders in Industry & Golf is a tribute to great international business leaders and their love of golf. A portion of the sales of Two Good Rounds: TITANS will go to Oceana for ocean conservation. It is available for purchase at twogoodrounds.com for $19.95.